Neptune is an 8th magnitude object, and Triton is 13th magnitude. Neptune, although large, because of its distance is only about 1/10th the diameter of Mars at its best. Neptune is fun to observe, as it is clearly a disk, and has a distinctive blue colour. Triton is never very far from Neptune, and can be seen with a 6 inch telescope in good conditions. A larger telescope is better. This photo is a bit of a cheat. I stacked 200 good Neptune photos at 1/13th sec exposure on the Canon. The Triton photo is a dozen 8sec exposures. At that exposure Neptune is very over exposed, so it is removed and replaced by the correctly exposed version. There is no other way I know of having both on the same photo correctly exposed. The photo is digitally zoomed in and cropped to make the objects look more prominent on the photo, but there is no detail. I've seen Neptune through the 28" at Greenwich but I don't remember Triton being visible at the time. I also noticed that Triton was looking rather green on the image. I went back and checked the original frames and they do have a greenish tinge. I have reprocessed the Triton image, being careful to align the colour channels, and there is a definate overall green hue. Another technique is to merge the colours and spread them out to give a uniform colour. (Useful for assessing star colours) I've now done that with my Triton image to give this overall colour. 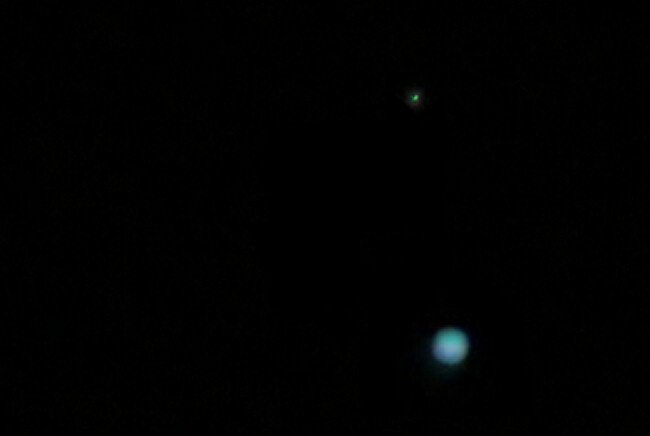 I don't think Triton is really green, but apart from a possible camera artifact, I have no explanation. Neptune, Triton, stars can fight 'em! Line from Astronomy Domine by Pink Floyd. I use this type of technique for lunar and planetary conjunctions.